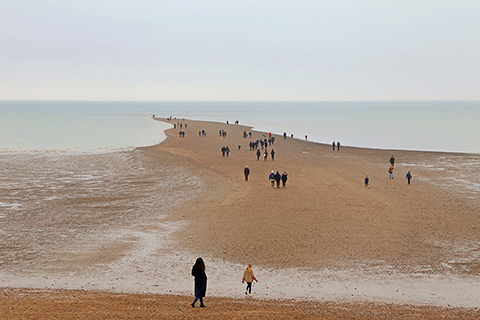 Beyond the Reach of Rivers is an exhibition by Mandy Williams that brings two photographic series about the sea to the beachfront in Brighton. Sea Level documents the sea at high tide, viewed through a series of beach shelter windows. Dust and neglect becomes part of the image, reflecting a sense of melancholy that runs through many seaside towns. Beyond Land is shot at a causeway revealed at low tide. Begun a month after the referendum, the line of people following paths out to sea not only documents our innate connection to water but can also be seen as a metaphor for the times.